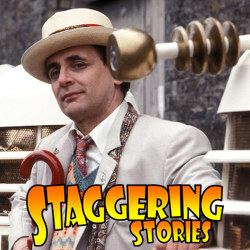 Staggering Stories Podcast #171: Blinking Thor! 02:08 — Doctor Who: Day of the Doctor cinema release. 05:34 — Atlantis: Second season ordered. 06:51 — Jonathan Strange and Mr Norrel: Finally cast and shooting. 09:01 — Paddington Bear: Peter Capaldi set for the feature film. 10:40 — Doctor Who: Still more rumours of more found episodes. 12:18 — Science: Time travel paper full of Doctor Who jokes. 14:36 — Doctor Who: An Adventure in Space and Time broadcast announced in UK. 16:14 – Doctor Who: Trial of a Doctor – The Tenth Doctor and Blink. 29:12 – Thor: The Dark World. 71:20 – Farewell for this podcast! 72:28 — End theme, disclaimer, copyright, etc. Cornell University: Traversable Achronal Retrograde Domains In Spacetime. Wikipedia: Thor – The Dark World. BBC: Doctor Who – Blink. Wikipedia: Doctor Who – Blink. Welcome to the Night Vale. 01:44 — Doctor Who: BBC anniversary programmes. 07:59 — Star Trek: J.J. Abrams will not direct the next film. 10:29 — Harry Potter: J.K. Rowling to write new spin-off films. 09:20 — Doctor Who: Doctors Revisited to finally screen in the UK. 15:08 — Doctor Who RPG: Second Doctor source book out in hardback. 17:29 — Doctor Who RPG: Christmas specials out on CD. 18:44 — Trial of a Doctor – The Seventh Doctor and Remembrance of the Daleks. 36:17 — Seventh Doctor overview. 43:29 — John Nathan-Turner retrospective. 51:32 – Game: Cheddar Gorge. 69:28 – Farewell for this podcast! 70:30 — End theme, disclaimer, copyright, etc. Wikipedia: Doctor Who – Remembrance of the Daleks. BBC: Doctor Who – Remembrance of the Daleks.